It’s amazing just how much more you can see once the leaves drop from the trees. And I don’t just mean the neighbours. Walking down the same trails you walked every day in the summer you discover things that you walked right by a hundred times and never noticed while they were hidden by leaves. The above is a great example. Hidden while the trees were leafed out, once the branches were bare the pale blob in the small sapling shone in the winter sun, clearly visible from the other side of the meadow. 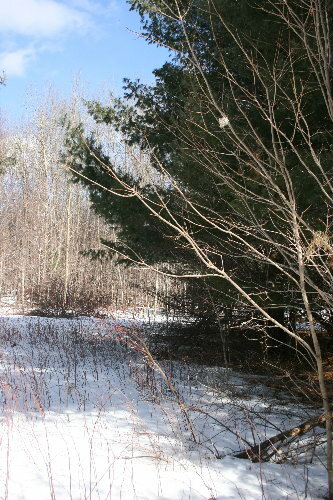 While the snow was deep I chose not to walk over, but once it had melted enough I made my way across in order to check it out more closely. It turned out to be a nest, but then, I was pretty sure it was a nest. What I was surprised by was the amount of birch bark woven into it, the pale material that made it glow so vibrantly. 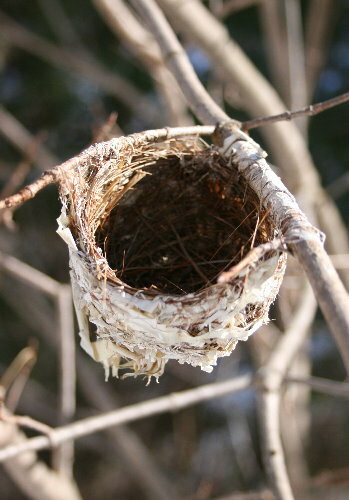 The nest belonged to a vireo, who make characteristic open cup nests suspended from a branch by their rim, rather than perched on top of the branch. 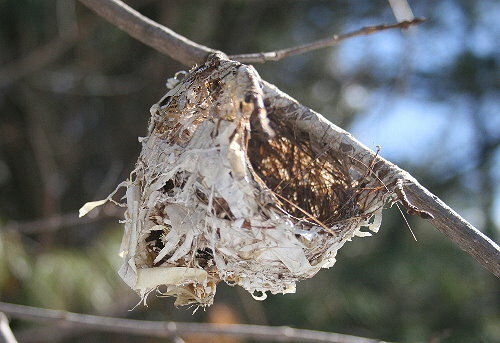 Vireos are the only species around here that build nests like this; the other species that build suspended nests (eg. Baltimore Oriole) have structures that are closed at the top, with an entrance hole in the side. It amazes me, really, that a vireo’s nest can be strong enough even when suspended by the rim that it supports four or five little growing bodies crammed in there together. I would have thought that the branch underneath would lend necessary structural support, but apparently the birds are such skillful weavers that even without glue or stitching their constructions will hold a full family, and then still last through the entire winter. Although I know it belongs to a vireo, it’s harder to be certain of which vireo. 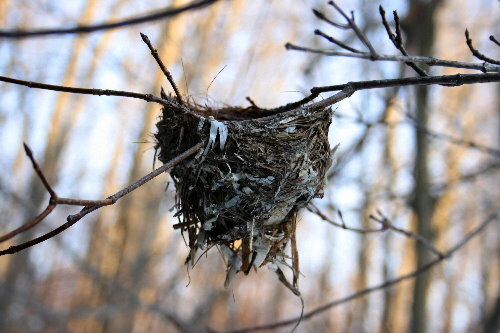 I’m actually reasonably sure that this one was built by a Red-eyed Vireo, who are known for using a lot of birch bark in the construction of the nest’s exterior. They also have a tendency to favour younger trees, thus building lower to the ground (although I had to climb this sapling in order to reach and pull down the branch it was in, it was still less than 10 ft high), and aren’t opposed to nesting along forest edges. They would also be extremely abundant through our area. This nest (can you see it?) was less than 100m away from the first one. It was also built low, perhaps 8 feet above the ground. It was also at the edge of the woods, but the area it faced on to was an open treed space rather than a meadow. The tree it was in was a tall mature maple, and the nest was just in a low horizontal branch. Even with the leaves gone, it’s still somewhat tricky to spot, blending in with the surrounding branches, unlike the first nest. The identity of this nest-builder is less definitive. 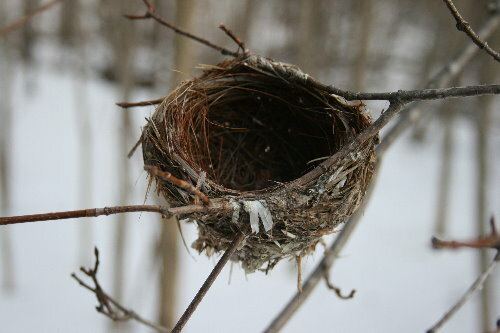 That’s the frustrating thing about nests in winter; so many are very ambiguous and you can’t be sure just who built it. Sometimes it’s tricky to even narrow it down to family (eg. sparrow vs warbler). At least I’m confident about that part in this case; it’s clearly a vireo. We haven’t been here for the breeding season yet, so we don’t know which species we have in our woods, although we have a pretty good idea of what to expect. At the very least we have Red-eyed and Yellow-throated Vireos here. We may have Blue-headed, too, if we’re lucky. There’s undoubtedly Warbling around in the riparian areas, along the beaver meadows and creek edges, but they wouldn’t be found in the forest. Blue-headeds nearly always build their nests in coniferous trees, so I very much doubt that this nest would be by them, even if we do have them in our area. Which leaves Yellow-throated and Red-eyed. The odds-on favourite is for another Red-eyed, simply because they outnumber the Yellow-throateds by about 65 to 1 in the Kingston region (in other parts of Ontario, this ratio is even higher; this is probably the best area in Ontario, and likely equal to many parts of the US, in terms of the proportion of Yellow-throateds in the vireo population). The book Birds of the Kingston Region by Ron Weir estimates one pair of Red-eyes per hectare (2.5 acres) in our area, so the proximity to the other nest might not be unusual. Also, Yellow-throateds have tendency to build high up in mature deciduous trees, so this would be unusually low. That said, however, the Ontario Nest Record Scheme has records of Yellow-throated nests as low as 4 ft, so it wouldn’t be unheard of. Mainly the only reason I would consider the possibility of Yellow-throated, really, is the relative absence of birch bark in the exterior, as they use less of it than Red-eyes usually do. But who’s to say this isn’t just a Red-eye with slightly different aesthetic tastes. 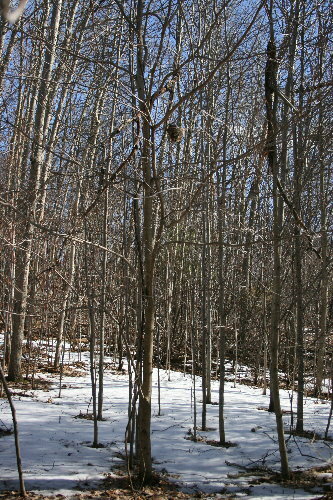 I took these photos a couple of weeks ago (hence all the snow on the ground; most of it’s melted now), but was reminded of them by a post by Huckleberry Days on a nest of mysterious identity. Bird nests are one of those typically winter topics, because you tend to see so many of them at that time of year, compared to in the summer when they’re usually more hidden (unless you’re actively looking for them). I stored up a few photos, but hadn’t got to writing about it. I’ve been amazed at how the winter has flown by – and suddenly, spring is upon us and I’ll have no shortage of blog material for another eight months! All right! That makes three nests I can now identify: vireo, Robin, and Pileated Woodpecker. Which is equivalent, I suppose, to knowing the difference between an elephant and a block of cheddar. These are wonderful views of such fine nests! I have never had such a good look at nests like these. I am awed by the skill these vireos demonstrate! Amazing. Thanks for your wonderful writing. Hey, it’s not that bad, Lavenderbay – it’s at least the difference between a rhino and an elephant! Thanks, Gerry! I like the lines of poetry, great imagery! They’re certainly something, eh, Amber? Birds can do amazing things with their beak that I wouldn’t be able to accomplish even with my opposable thumbs.